When space is tight and when, as a keen kitchen gardener, you've simply run out of space there's only one option left - head skywards! Vertical growing is the ultimate technique for bijou gardens that makes use of the one dimension that there's plenty of. In this instance the sky really is the limit! Vertical growing has come of age over the past few years, with many off-the-shelf contraptions helping space-strapped gardeners get the most from their plot. The really clever ones can turn a bland garden wall into a fresh flush of salads, herbs and fruit – and what home-grown devotee wouldn't want that? Meanwhile there's all manner of climbing veg plus sprawlers that can be tied into position which will help you to boost productivity from the meanest of footprints. A great place to begin to satisfy lofty ambitions is with the vegetables and fruits that naturally climb or can be made to do so with gentle encouragement. This includes the likes of climbing beans, climbing peas, vine tomatoes and the cucurbits: cucumbers, melons, squashes, pumpkins, gourds and sprawling types of courgette. If you're reading this in a warmer part of the world you can add sweet potatoes to this list. Many climbers produce tendrils that grip the structure they are climbing to literally pull the plant up as it grows. Others, such as the beans, will wind their way around a support to head skywards. The natural sprawlers such as vine tomatoes and courgettes may require tying in to their supports at regular intervals. Either way these will all make the most of the vertical plane. Most tree fruits such as apples and cherries can be trained into space-efficient shapes: vertical cordons, espaliers, fan shapes or any manner of creative but fence-hugging formations. Cane fruits like raspberries and blackberries grow naturally tall – the trick here is to keep them from flailing around onto their neighbours. Grow them hemmed in between rows of parallel wires or tie individual plants to vertical posts. There are plenty of ways to make the most of the vertical plane. Here are just a few ideas to get you started. A-frames: These can be made from wooden trellis, horizontal battens of wood or netting held taut between the two frames. Lean the frames together and secure at the top with wire or hinges. Grow climbers up the two frames and use the space between to grow plants that will appreciate shade during the warmer summer weather: salad leaves and spinach for example. A well-constructed frame can be used year after year – just pull it free from the ground at the end of the season and store in a shed or garage. Living wall: Invest in one of the many wall or fence-mounted modular planters or panels available. Fabric Woolly Pockets are just one example. There are also many stackable planters that can be built from the ground up. Plant them up with herbs, salads and strawberries and watch a blank space take on a whole new life. Try making your own by hammering in or hanging from hooks all manner of recycled containers: large food tins with holes punched into the bottom for drainage (try painting them for additional interest), rows of window boxes secured one above the other or even pots made from old undergarments as seen at a recent flower show! Hanging about: As well as growing up from below, many climbing or sprawling edibles can be grown from above and left to hang down. Vine tomatoes are best for this and work well in 'upside-down' planters. Make a hole into a large bucket that's just big enough to allow you to plant up the tomato. The hole must also allow the stem to thicken as the plant grows. Plant the tomato, feeding compost around the rootball and fill to the top of the bucket. Sow or plant at the top shallow-rooters such as lettuce, radish, basil or stump-rooted carrots. Hang up then feed and water from above while the tomato erupts out from beneath. You can also grow strawberries and other fruiting veg such as peppers and aubergine in this way. The result is literally buckets of produce! 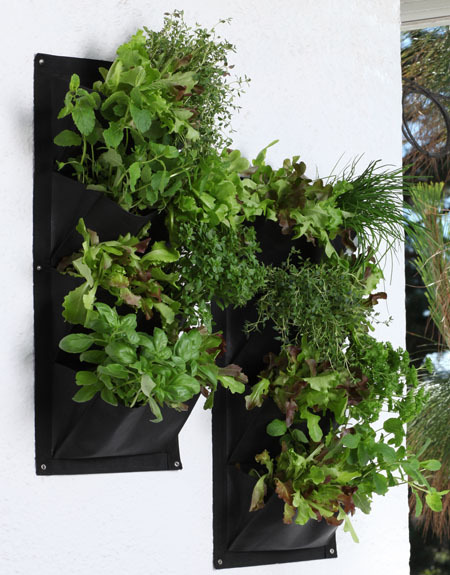 Edible divider: Looking to divide up areas of your garden? An edible divider is far more attractive than a solid conifer hedge or artificial alternative – and you can eat it! Espaliered fruit trees (where the branches run parallel to each other in horizontal rows) make excellent natural dividers. Train the trees onto trellis to provide an all-year-round divider and plant the base up with annual vegetables or flowering herbs such as rosemary to keep pollinating insects busy for longer. Annual climbing veg such as peas and beans make excellent seasonal screens and have the bonus of being very quick growing. Sound options for supporting them can be found here. Archway of delights: Visitors will immediately know you're a passionate grower of all things edible if you plant an edible archway leading up to your front door. Simply plant each archway support with its own climber and watch as over the growing season the archway is consumed by a lush jungle of foliage, pods and fruits. Squashes and beans with coloured pods (try alternating purple and yellow-podded varieties such as 'Blauhilde' and 'Goldfield') look especially impressive given this treatment. The pods and fruits will dangle down above head height to create quite a visual impact. Beans with strongly coloured flowers such as the classic 'Scarlet Emperor' are as floriferous as the best of the traditional ornamental climbers – a feast for both the eyes and stomach. Try out a few of these sky-reaching options and see how much more produce you can get from your plot. I'd be very interested to learn of your vertical growing experiences, so please share any other ideas for vertical growing below. "Try a recycled wood palette with some strawberries! here's a quick video with links for how to do it. http://youtu.be/21aaTQqub_U"
"Hi Chringram. This looks like a good idea - very ingenious!" "Has anyone else got ideas for vertical growing? Please share them here!" "Is there any way to add this in to the garden planner? I'd like to be able to plot this out :-)"
"Hi Georgy, the Garden Planner currently includes icons for arches, arbors, pergolas, tower planters and wigwams to help you to plan your vertical garden - they can be found by clicking on the drop-down box just above the plant selection bar, then clicking on Garden Objects. We're looking into possibility of including more vertical planting options in the future too." "Great tips! Just be add: although a fence covered in vines is one of the most attractive features you can add to your yard, vines can be as destructive as they are beautiful. You need to explore options carefully, and inform yourself about vine types that are more destructive, like fast-growing, woody vines and invasive species of vines. Read more: http://blog.fenceauthority.com/posts/how-to-grow-fence-friendly-vines"
"Hi Sam. Very much appreciate the advice here, thanks."